#C-74 in service, July 9, 2005. Paul Swanson photo. 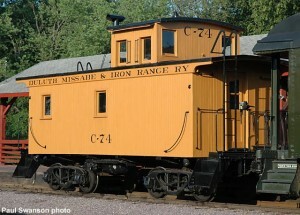 DMIR C-74 caboose in fresh paint. Oct. 1970. Ektachrome 35mm transparency, Philip A. Weibler photo. 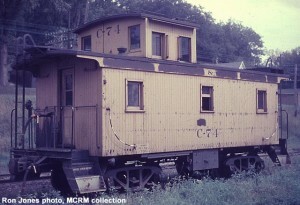 DM&IR #C-74, 1965. Uptown at North Freedom on the transfer. Montgomery Ward film. Ron Jones photo, MCRM collection. 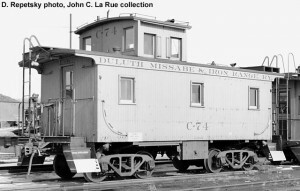 Duluth, Missabe & Iron Range caboose #C-74; Duluth, MN; c.1964; D. Repetsky photo, John C. La Rue, Jr. collection. 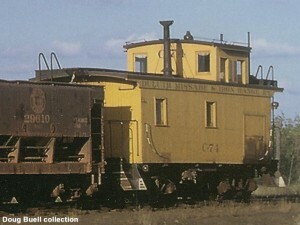 C-74 at the east end of Mitchell Yard, Hibbing, MN, 9-2-62, Doug Buell collection. #C-74 is the workhorse of Mid Continent’s freight fleet. 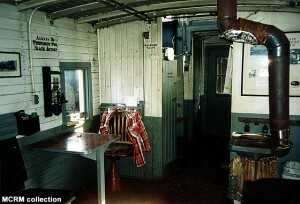 It features a cupola above the roof for trainmen to view their train, several bunkbeds for overnight quarters, a desk for the conductor to perform his paperwork, and the ubiquitous coal fired stove for heat in winter weather. 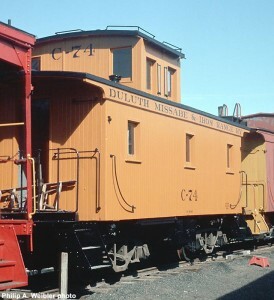 Built by the Duluth Minnesota & Northern in 1924 (and re-lettered for the DM&IR in 1937), this car spent its active career on the hind end of ore trains operating in northern Minnesota. It features a steel underframe to withstand the rigors of heavy ore service. Each end of the car is equipped with twin air hoses for airbrakes. The upper hose was used with DM&IR’s ore cars which had their air hose mounted higher on the end of the car for easier coupling. In later years, an electric generator was installed in one end of the #C-74 to power electric lights. 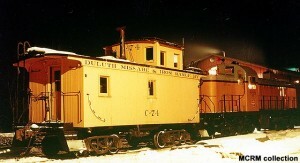 #C-74 was purchased by Mid-Continent members in 1965 and moved to North Freedom. In 1978, it was donated to the museum. 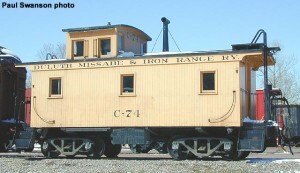 Restoration of #C-74 has maintained its appearance as it was retired from Missabe service in 1965. It is used in regular service at North Freedom during the summer, providing patrons the experience of riding in an authentic caboose.